Meet Bertrum the Lhasa Apso. I did this Pet Portrait back in 2013 and only just realised he wasn't on my website which is terrible as he is absolutely adorable! I met Bertrums Mum Joanne at the RSPCA dog show in Ashley Heath where she asked me to do a painting of her adorable yet cheeky pooch. 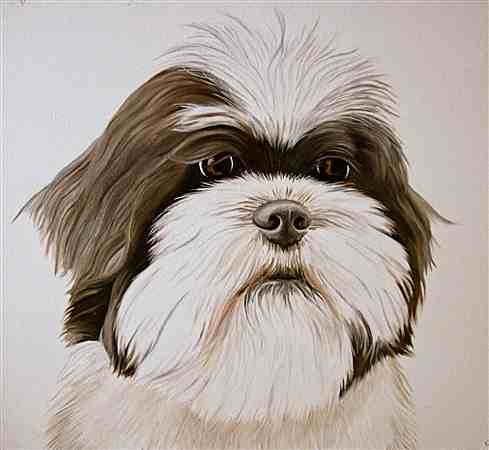 "I met Lucy at a RSCPA Dog Show and asked her to paint a portrait of my puppy Lhasa Apso Bertrum. Lucy was professional to the end and I am extremely happy with the final result; would highly recommend her services and will definitely use her again in the future."